Mobi2do’s Application solutions address a diverse range of critical enterprise issues that enable enterprises to decompose business complexity, alleviate organizational stress and instead, concentrate on strategy and growth. Our Application services facilitate effective development and integration of underlying, growth-enhancing applications into complex organizational architectures. We address real-time integration demands of enterprises which require integration of entire enterprise assets like internal enterprise environment, business functions and staff operations with extended enterprise eco-system and infrastructure. We help enterprises streamline, standardize and manage business processes by automating critical enterprise operations. Our Enterprise Resource Planning (ERP) solutions allow enterprises to enjoy real-time information sharing and access mission-critical data through a single platform. 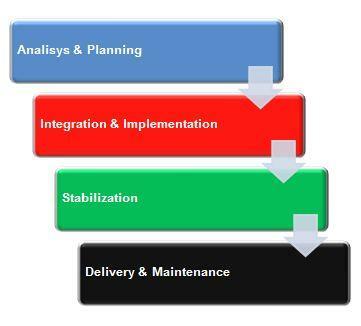 We provide the strategic roadmap to enterprises by integrating and automating key functions and transaction processes. Service Highlights: Mobi2do's feacture services like Consulting, Product Development, Integration, Implementation, Upgrade and Support. Our methodology comprises of initial audit of client’s environment, technological assessment of the system’s potential/caliber, and then, development/integration/implementation of application followed by post-implementation measures like risk management, performance and consistency analysis. ERP (enterprise resource planning) is an industry term for the broad set of activities that helps a business manage the important parts of its business. The information made available through an ERP system provides visibility for key performance indicators (KPIs) required for meeting corporate objectives. ERP software applications can be used to manage product planning, parts purchasing, inventories, interacting with suppliers, providing customer service, and tracking orders. ERP can also include application modules for the finance and human resources aspects of a business. Typically, an ERP system uses or is integrated with a relational database system. Business to Business are crucial for transaction integrated solutions. Mobi2do grew its experience in the field by providing software development services for major players in the industry. One slice of the coding expertise relies on the integration of external and internal processes between different application systems and business partners. Mobi2do team proves to be the ideal IT engineer team to carry out international projects in a quick and reliable manner. An exclusive client dedicated team focuses on the applications delivering the contracted project always on time. Challenges of The B2B . The B2B Model has considerably developed in the last decade, currently promoting various business models. New payments systems, new transportation systems and new sector integration methods strongly affect the way of designing specific software. Working with software development international teams brings in more expertise and a global view.